Research in the Fluvial Landscape Lab focuses on the ecology, hydrology, and geomorphology of aquatic systems. Simulation modeling, spatial analysis, and remote sensing, combined with field research, comprise the majority of the work in the lab. The Nyack Floodplain of the Middle Fork Flathead River is one of the best studied montane alluvial floodplain on Earth. In collaboration with scientists based at the Flathead Lake Biological Station of the University of Montana, members of the Montana State Fluvial Landscape Lab work to understand how the hydrology of the floodplain -- especially the so-called "hyporheic exchange" of water between the river channel and underlying gravels -- influences nutrient cycling, productivity, and habitat availability on the floodplain. Lab Director Poole has been conducting research on this site since 1995, focused primarily on modeling patterns water movement both across the floodplain surface and in the subsurface. 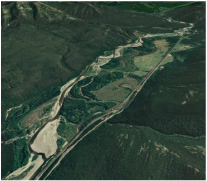 Understanding floodplain topography and geomorphology (Poole et al. 2002) was key factor in the success of building (Poole et al. 2004) and applying (Poole et al. 2006) a novel hydrologic simulation model to describe the hyporheic hydrology of the system. Subsequent work by former Ph.D. student Ashley Helton described the hydrologic residence time of the floodplain both on the surface and in the subsurface (Helton et al. 2014) and also incorporated heat and dissolved oxygen transport through the floodplain gravels (Helton et al. 2013). Ongoing work attempts to link microbially-driven nutrient and carbon cycling in the aquifer to the ecology of the entire channel-floodplain-aquifer system. Using funding from the National Science Foundation, researchers in the Fluvial Landscape Lab are working to understand the consequences of sea level rise for the biogeochemistry of coastal wetlands. Working with Dr. Emily Bernhardt of Duke University, and Dr. Amy Burgin at the University of Nebraska, lab researchers hypothesized that the delivery of salt and sulfate in sea water would radically alter the nutrient cycling of freshwater coastal wetlands by altering the predominance of microbial metabolic pathways. Poole, former post doctoral research associate Rob Payn, and current postdoctoral research associate Ann Marie Reinhold are developing a simulation model (Payn et al. 2014) designed to describe how microbial metabolism will shift in response to changes in the availability of key electron donors and acceptors. Poole and Ph.D. student Sam Carlson are part of an NSF-funded research collaboration with Ellen Wohl (Colorado State University), Bob Hall (University of Wyoming), and David Walters (USGS, Fort Collins) investigating the effects of log jams, associated sediment, carbon, and nutrient storage, and resultant aquatic community response in montane headwater streams of Colorado. We are developing a simulation model that links carbon processing to nitrogen transport and uptake dynamics in stream networks. The model simulates nitrogen removal from streams (via denitrification) as a function of nitrate concentration in the stream and stream metabolism. Metabolic rates are predicted from log jam density, channel form, valley morphology, and stream temperature. We are now able to simulate patterns of change in stream network N processing dynamics in response to changes in land use and log-jam frequency and we are working toward simulating expected changes in stream network nitrogen cycling under alternative future climate scenarios. Lab director Poole began investigating issues surrounding of stream water temperature in 2000 while working for the Region 10 office of the Environmental Protection Agency in Seattle, WA. At the time, despite a plethora of pathways by which humans alter water temperature (Poole and Berman 2001), management prescriptions to address stream water temperature were focused almost entirely on increasing riparian shading on streams. Poole, along with collaborators at the University of Montana and UC Santa Barbara, worked with tribal researchers and staff at the Confederated Tribes of the Umatilla Indian Reservation to show that hyporheic exchange -- the bidirectional recirculation of water between a river channel and underlying gravel -- was an important driver of stream temperature on the Umatilla River (Arrigoni et al. 2008), and that geomorphology was an important driver of surface inundation (Jones et al. 2008a) and therefore hyporheic exchange (Jones et al. 2008b) in the Umatilla River. Since that time, the Umatilla Tribes have embarked on a major restoration effort on Mecham Creek, a major tributary to the Umatilla River. The explicit goal of the restoration was to increase hyporheic exchange to improve water temperature for trout and salmon. Ph.D. student Byron Amerson is engaging in research to monitor hyporheic response to the restoration and subsequent changes in surface water temperature. In a parallel project, M.S. student Katie Fogg is developing a state-of-the art simulation model to describe how the rate of hyporheic exchange and the residence time distribution of water in alluvial aquifers influences stream temperature at both the daily and annual time scales. Hybridized cutthroat/rainbow trout. Source: nps.gov. Introgressive hybridization with introduced species is threatening the genetic integrity of many native fish populations, including Cutthroat Trout in the western USA. Hybridization rates within a sub-population of native fish is influenced by the distance between the native sub-population and any other sub-population that may be a source of non-native genes. The effect of the spatial arrangement of stream bifurcations and sub-populations (i.e., the network topology) is poorly documented, however. Ph.D. student Patrick Della Croce developed and applied a novel individual-based simulation model to compare the spread of non-native genes across three stream networks with differing network topologies: linear, trellis, and dendritic (Della Croce et al. 2014). The simulations suggest that the nature and the strength of the relationship between hybridization and distance is influences by stream network topology. Specifically, bifurcations may act as permeable barriers to the spread of non-native genes across a network. Subsequent work with the model is revealing that standard approaches to estimating the uncertainty surrounding detecting and quantifying introgression generally yield marked overconfidence in the reliability of a given sampling effort to detect or quantify hybridization.